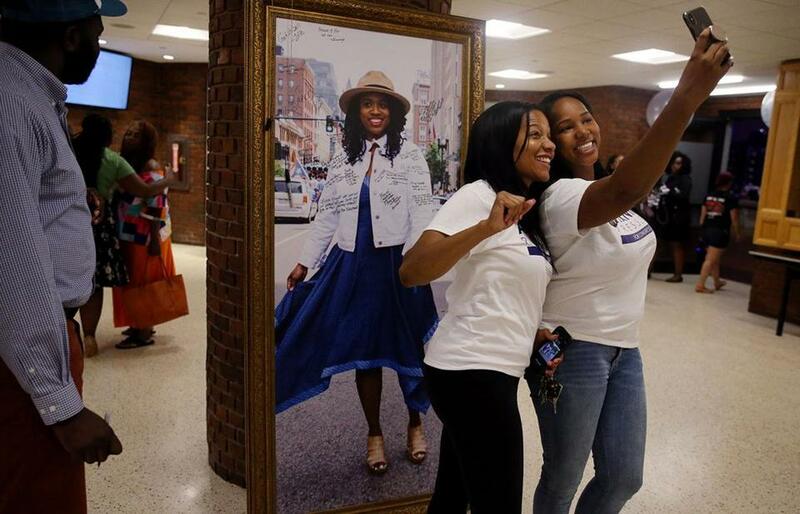 Courtney Leonard and Lianne Hughes take a selfie with a portrait of Ayanna Pressley during the campaign’s primary night celebration in Dorchester. In Massachusetts, there’s one sure way to make our politics healthier and our economy fairer: Millennial renters need to show up at the polls more often. Much of the time, they look on from the sidelines — acting like what a Google research team describes as “interested bystanders.” But when they speak up, they can disrupt everything. The power of energized younger voters was evident this past week, as Ayanna Pressley, a Boston city councilor, routed longtime US Representative Michael Capuano in Tuesday’s Democratic primary. In this race between an African-American challenger and a longtime white incumbent, the ethnic breakdown of the Seventh Congressional District got all the attention: While most of its registered voters are white, most residents are black, Latino, or Asian-American. But the demographics are striking in another way. According to the data-analysis unit of American Public Media, the Seventh has a higher percentage of millennials than any other congressional district; 40 percent of voting-age residents are 22 to 36 years old. Pressley ran her campaign accordingly. Though outspent 2 to 1, she made major inroads via social media. To her 40,000-plus Instagram followers, her blowout victory likely came as far less of a surprise than it did to ink-stained pundits. Something else important happened: Tuesday’s voter surge also took down state representatives Jeffrey Sanchez and Byron Rushing, two incumbents with solid progressive credentials but too much fealty to Robert DeLeo, the relentlessly old-school House speaker. DeLeo’s chamber is where progressive goals — such as protecting some immigrants from deportation and reforming the state’s xenophobic zoning laws — go to die. Whether it was Pressley’s star power or liberal outrage against Trumpism that got new voters to the polls, the losses by Sanchez and Rushing hint at how state and local politics might change if fair-weather voters paid more attention. 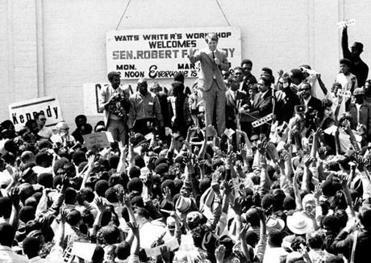 Robert F. Kennedy’s daughter recalls how her father looked to young people for inspiration. Read: Aim higher on housing for middle class in Mass. There’s something crazy about the normal voting pattern in Greater Boston. People of all ages and all backgrounds line up for presidential elections where, at least in Massachusetts, the conclusion is all but foregone. (Spoiler alert: The Democrat wins.) But in other years, in races for Congress on down, turnout plunges among young people, renters, and others on the margins of the high-cost, high-pressure Massachusetts economy — even though each individual vote matters more. According to research by Portland State University in Oregon, the median age of voters in a Boston mayoral election is 51, more than 14 years older than the average adult in the city. The day-to-day interaction between local government and the public shows a similar skew. In a new study, Boston University researchers found that the people who spoke up at Boston-area public meetings about proposed housing were disproportionately white, older, and wealthy. They were also disproportionately likely to be homeowners. This isn’t entirely surprising. Young renters have less contact with City Hall than someone renovating a home, notes Kei Kawashima-Ginsberg, director of the Center for Information and Research on Civic Learning and Engagement at Tufts University. But they should do everyone a favor and speak out anyway, even if they’re unsure where they’ll eventually put down roots. The absence of younger people from the housing debate leads to snob zoning and spiraling costs — which suits lots of existing property owners just fine. The safest way to build wealth in Massachusetts is to have owned property in the 1990s; then, lobby your city or town to block the construction of anything else. To the extent there’s any message at all to younger adults trying to break into the housing markets, it’s this: Pipe down. Someday you’ll get your turn. Which, not coincidentally, is the same discouraging message the state’s Democratic establishment sends to upstart politicians. It’s the same mindset that Pressley challenged with her slogan “Change Can’t Wait” — and that all those new voters in the Seventh District voters rejected on Tuesday. So, what’ll it take to get younger people more involved with local affairs more regularly? Researchers offer some bite-size suggestions. Katherine Levine Einstein, lead author of the BU study, suggests notifying renters more aggressively about community meetings. Kawashima-Ginsberg points to initiatives like participatory budgeting, which try to draw young voters into decisions about whether to fund, say, bike rakes or skateboard ramps. Alternatively, younger people of voting age could, like, just show up at the polls, as they did for Pressley. For all the stereotypes of spoiled millennials — insert joke about avocado toast or participation trophies here — the problem is that they don’t assert themselves nearly enough. Soon enough, they’ll outnumber baby boomers in the electorate. The sooner these new voters recognize their own power, the better. Somerville is changing, and so are its voters. Just ask Ayanna Pressley.